Transcontinental race would start on Sunday 29.7. and finish on Tuesday 14.8., Silk road mountain race would start 18.8., only 4 days later. I would be away from home for over 6 weeks so I wanted as few extra days travelling as possible. However I also wanted one extra day at Geraardsbergen before Transcontinental race to handle possible delays and last minute bike fixes. So in short, I wanted to be at Geraardsbergen by 27th of July, get to Bishkek as soon as possible after Transcontinental race finishers party on 14th of August and back home after Silk road mountain race’s party on 1st of September. Most of the time I was travelling in areas that I am familiar with. Getting around Europe was going to be just balancing between fast, cheap and practical. I wasn’t so familiar with options travelling to Kyrgyzstan. Silk road wasn’t announced until late in Autumn 2017 and it was going to be a tight schedule with Transcontinental race. The first concern was getting from Meteora to Bishkek in a few days. That problem was solved with direct Turkish airlines flight from Istanbul to Bishkek. Getting back was almost as easy as Russian railways website listed a direct train from Bishkek to Moscow. Then there was lots of pondering about bicycle. Essentially there were two options. Somehow send one bicycle to Bishkek and another back home from Meteora or use the same bicycle for both. 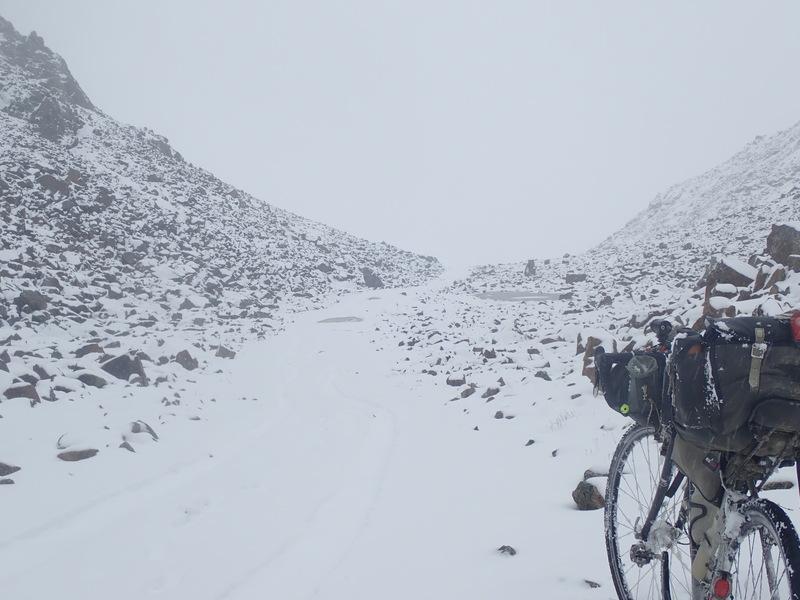 Those who know more about Transcontinental and Silk road know that they have very different requirements for the bicycle. The other is ridden on road and the other is ridden on, well, anything that happens to under your bicycle. 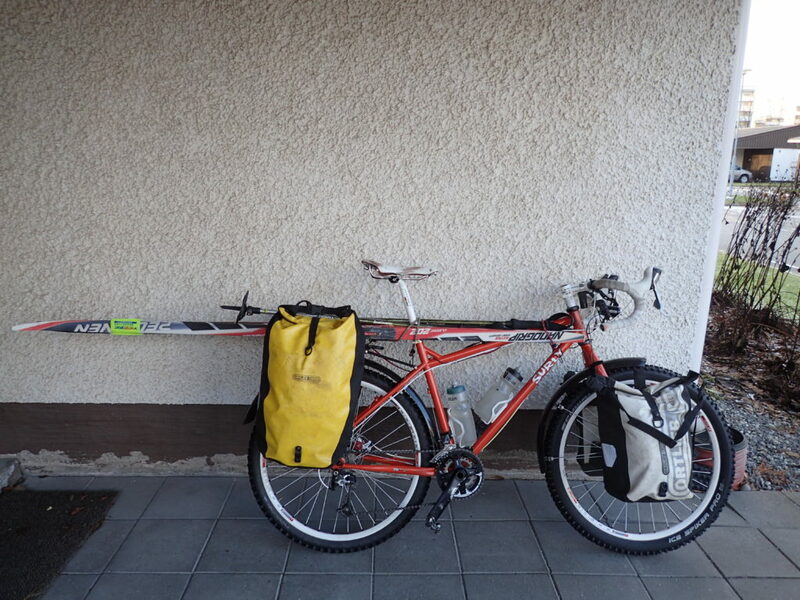 It turned out the most practical way to do it was to use the same bike for both. Price and paperwork for sending bicycle outside EU as a private person just wasn’t practical. I contacted my hotel in Meteora in spring and asked if I can send a baggage there. It was ok, so I would just send everything needed specifically for Silk road to Meteora and send Transcontinental specific stuff back home. 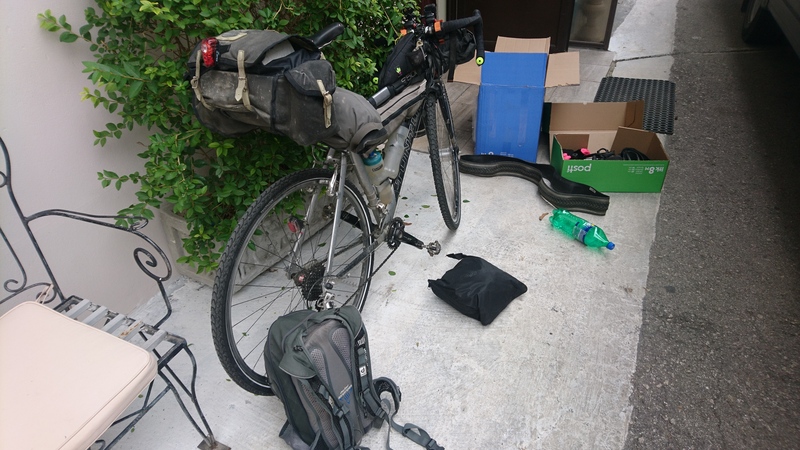 I initially planned using my swiss-army-knife-bike Surly troll for Silk road, but couldn’t figure out a way to ship it to Kyrgyzstan. There were three possible options. Or two, after I noticed that Lux express’ buses don’t go from Tallinn to Berlin any more. 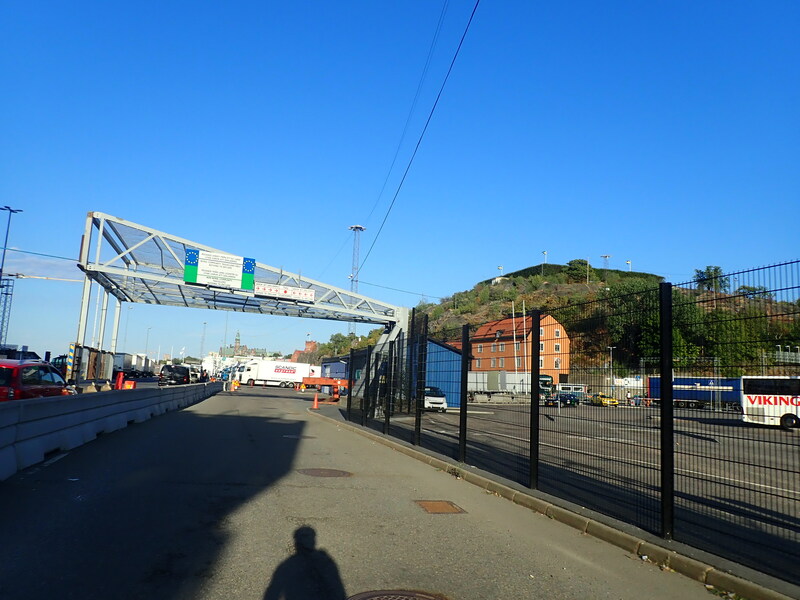 The most obvious one, that I was most familiar with, was the ferry from Helsinki to Travemunde, cycling to Hamburg, taking a train to Aachen and riding to Geraardsbergen. Pricing of the Finnlines ferry is outrageous compared to other options. Two to three times more expensive, yet it is also the most comfortable option. Train would’ve been to Aachen, last city in Germany, because you still can’t purchase online a train+bicycle ticket over a national border (hey EU?). Second option, and the one I chose, was Flixbus from Stockholm to Leverkusen. I hadn’t used that company before, but I chose them as the ticket was cheap (80 euros with a bike, 120 if you include train+ferry to Stockholm) and you could buy a place for bicycle. I wanted to take it easy on the way to Geraardsbergen so I decided to stop at Namur for a day. Train from home to Turku and ferry to Stockholm were just business as usual. If you live in Finland you don’t really ”plan” those trips. Any more than you would ”plan” your trip to work or to toilet. Train to Thessaloniki, bus to Istanbul and flight to Bishkek. I didn’t find a way to buy online a bus ticket to Istanbul, but I assumed it wasn’t going to be a problem getting it from the station. Train and flight were just business as usual. The next train from Bishkek to Moscow was going to leave Monday morning. Just one extra night in Bishkek after Silk road. My bus from St. Petersburg to Helsinki wouldn’t leave until Thursday midnight so I took a later train from Moscow to St. Petersburg just to have 5 hours for tourism in Moscow when changing train. I hadn’t been to Moscow before. Kyrgyzstan and Kazakhstan don’t require a visa and I had applied for a dual visa to Russia when I participated Baltic 1200 brevet from Kaliningrad earlier in the summer. At Klaipeda bus station on my way to Kaliningrad. Packing and unpacking the bike is required by some bus and train companies. It is usually irrelevant, but operators just try to avoid other passengers complaining grease and dirt getting into their luggage. I had a list of items that I would have to send to Greece. If you want to know more about my bike setup you can find it here. The bag drop to Meteora. 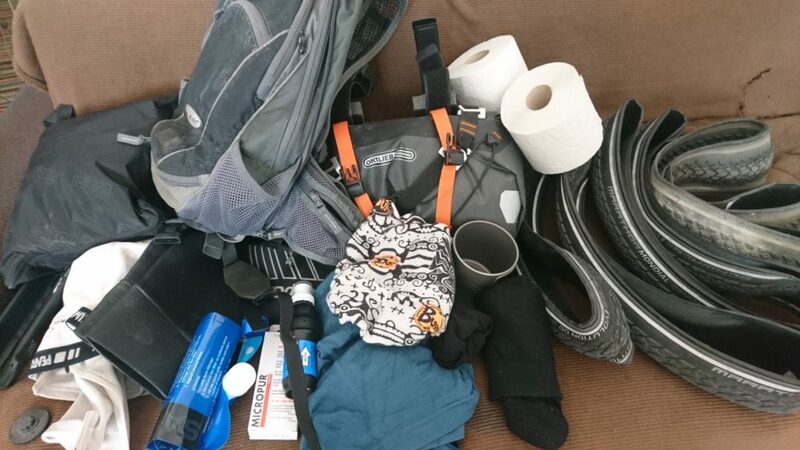 Backpack, bicycle bag, sleeping bag, handlebar bag, new tires, clothes, water filtering, toilet paper, cranks, cup, camera helmet mount and tools. I sent the package, along with return box, to Meteora in mid July. It wasn’t until after I had left home for Geraardsbergen that the hotel confirmed they had received it. I was a bit stressed about that as I left. If it would be returned, I wouldn’t be at home to resend it. As a minor detail, I had to pack my insect repellent and hand disinfectant to my Transcontinental kit as it is not allowed to send them by mail due to fire hazard. What the? 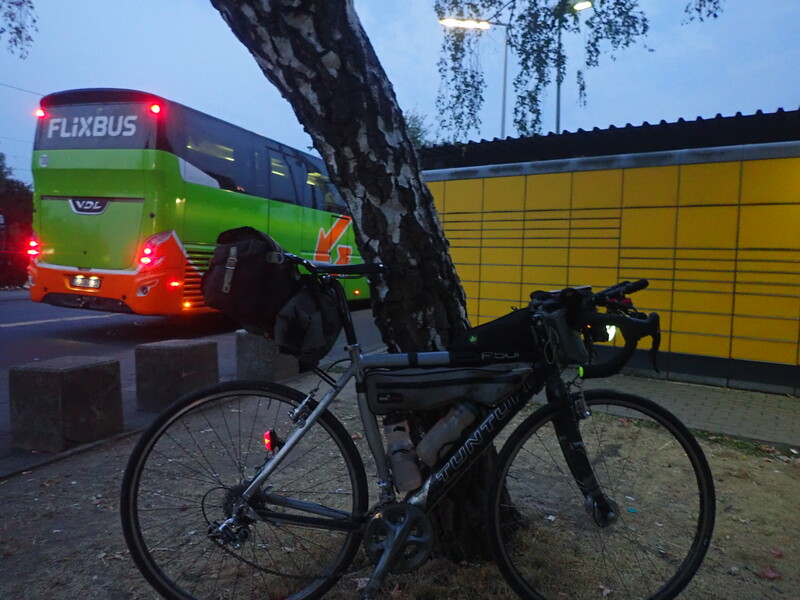 As I woke up 5 am after a too short sleep to catch a train to Turku I had received a text message from Flixbus noting that my ticket had been moved to next day because the bus wouldn’t have a bike rack. Well. Great. As I already had all the other tickets I was expecting extra day in Stockholm and was happy that I had reserved an extra day for travel. I decided to go to the station anyway to see if there was going to be enough space in the bus for my bicycle. After slacking at a Espresso house and buying food for the bus trip, I went to T-centralen to wait for the bus. Riding out of ferry at Stockholm. In my opinion bicycle is by far the easiest way to travel by ferry. Fast and easy to get in and out. No need to worry about how get to and back from terminal. Also cheap (5-10 euros extra). When it is raining or cold you can always wait inside until boarding starts. The car fields usually don’t have a place where to sit down or have shelter. As I later discussed my experience with other Transcontinental race participants I heard that this is unfortunately common with Flixbus. Last minute delays and changes for travellers with a bicycle. Most ridiculous is that there is literally always room inside a bus for one or two bicycles and it is a lot safer to transport bicycle in the luggage compartment than in a rack. My bicycle has been in a long distance bus, train or ferry for well over 500 times and so far there is only one case that I’ve been left out. It was years ago due to a full train from Imatra to Helsinki. Even then it was just a few hour wait for the next train. This time packing the bicycle for bus was just taking the wheels off. Looks like I forgot to put the chain on before taking the photo. So the problem with the bus ticket wasn’t really a problem and I was on schedule in the bus as planned. There was very little drama on the way to Geraardsbergen. Bus arrived to Leverkusen shortly before sunset. I checked my bike and left for Namur. A short stop to get some water and street food near Leverkusen. A full moon and quiet roads on the way to Namur. Just perferct time riding a bike. A short coffee stop at a bakery at Huy when bakeries opened. Arriving to Namur around 9 am. A day and night at a hotel eating and sleeping. Then last 100 km to my B&B outside Geraardsbergen and I was all set for the Transcontinental race. 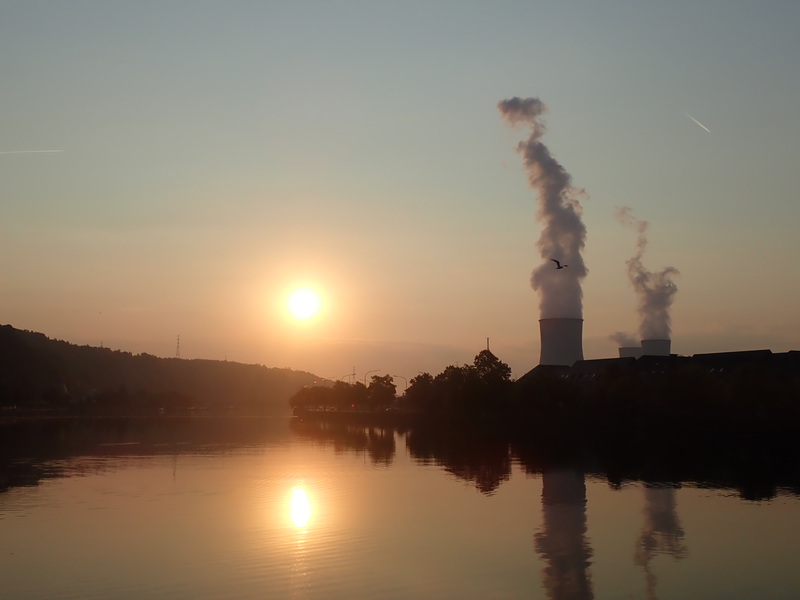 I followed Maas river to Namur. Very beautiful morning. Nights are usually the best time to ride bike during summer. Days tend to be uncomfortably hot and going through bigger cities is faster when there is no other traffic. Transcontinental race was about 4000 km via 4 checkpoints, Bielerhöhe, Mangart saddle, Karasnoze pass and Bjelasnica to Meteora. It is a different story and it pretty much went as planned. I finished in 15 days and I had booked my hotel rooms accordinly in March. Collecting stamps from remote places is a good excuse to go see the world around you. Time to turn the road bike to mountain bike. I was kind of stressed not to break anything that is either hard or impossible to replace on site. Luckily changing tires, cranks, lights, pedals and bike bags was as straight forward as it usually is. I was done in little more than an hour. I packed my box to be sent back to Finland and went to post. Or tried to. My earlier opening hour question was probably lost in translation as I expected post office to close at 7:30 pm. Instead it was closed and opens at 7:30 am. Silk road setup ready. Looks like I didn’t forget anything. Though on the way to Bishkek I bought a space blanket and gas stove. I went to buy a train ticket and asked the tourism office if they knew how to book a bus ticket from Thessaloniki to Istanbul. They gave me a phone number and I called the bus company to reserve a ticket. Problem solved. Next morning, before train left at 8 am, I rushed to post office to send my package back home. Or tried to. Wednesday was a national holiday and the post office was closed. I rushed back to hotel and explained the situation and they agreed to send the package to Finland. Box already had all the needed contact information. Package was waiting in Helsinki when I returned home. I had almost 10 hours wait in Thessaloniki as there were only 2 trains per day and the later was too late. There really isn’t much to do at Thessaloniki on a national holiday. The city was closed, beaten and hot. This was my 4th time in the neighbourhood and after seeing many places, Thessaloniki is still the most desperate place I’ve been to. Bus left 10 pm. I had a bicycle bag in my bag drop so I packed my bike for transport. 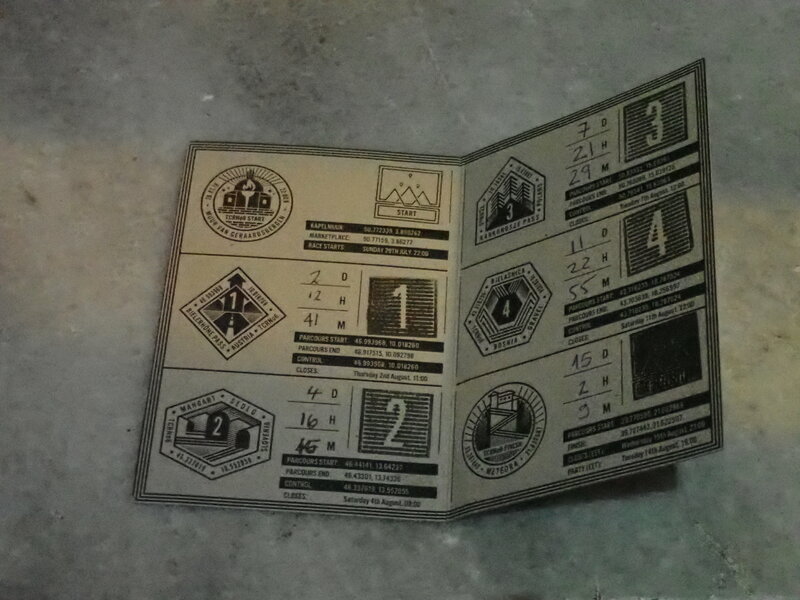 At Turkey’s border I withdrew some liras from a bankomat. The liras most recent downfall had started a day earlier so I was happy with the extra 10-15 % discount on everything. This was the first country of the trip where I needed to use a special roaming package for my phone. It cost 20 euros. It would’ve been cheaper to get a local SIM, but I didn’t want to waste time looking for a operator’s shop. As I arrived in Istanbul I went to a local mall to get some coffee. I also visited a Decathlon to buy a space blanket and a replacement for my broken spork. I never found a spork so I eventually bought a real spoon and fork from a market in Bishkek. 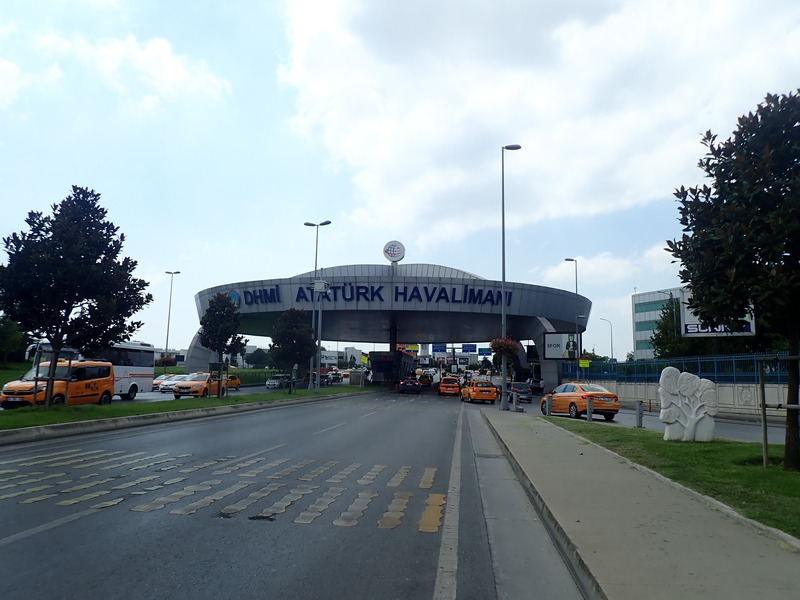 This was the first time I cycled to Ataturk airport in day time. Road was a bit busier than at night time. Long time no see. First 3 Transcontinental races finished in Istanbul and fourth in Canakkale so finding a way to airport was easy. Then the ever frustrating airport security check where you have to empty all the bags of your bicycle. It takes about 20 minutes with my setup. 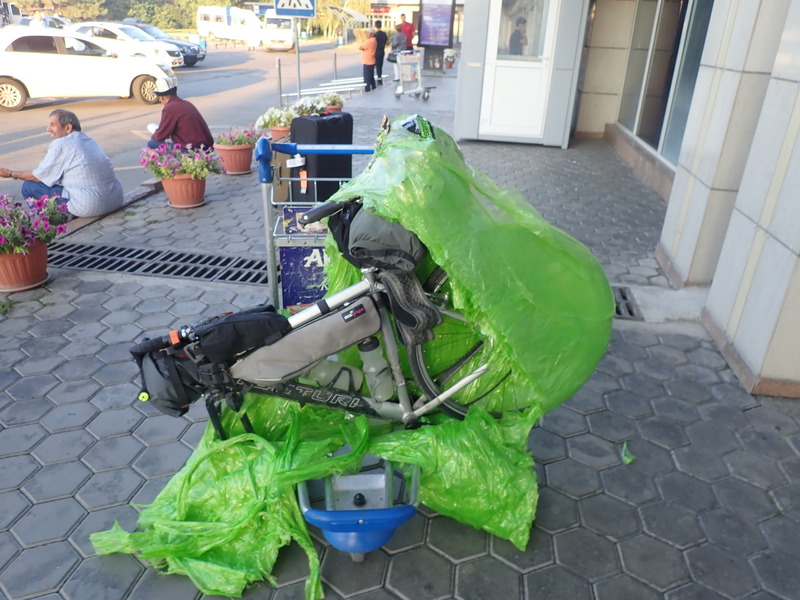 Went to claim my ticket, buy the special luggage ticket for the bicycle and wrap my bike in plastic. This time none of the secure plastic stands wanted to wrap the entire bicycle so I had to take off the front wheel. It is a road to disaster as something can get stuck between the spokes and there is nothing protecting the fork, but everything went fine. Only thing broken in transport was a ziptie holding the other bottle cage. Another 10 hours wait. This time at airport. If I had been smart , I would’ve gone to a lounge right away. Instead I slacked around for a few hours to eat and drink coffee. The lounge would’ve essentially cost the same that I anyway spent in food and they had a shower, and a good looking buffet. I could’ve really used a shower as I felt kind of rotten after 2 days of travelling, but that is business as usual. Christmas present at Bishkek. 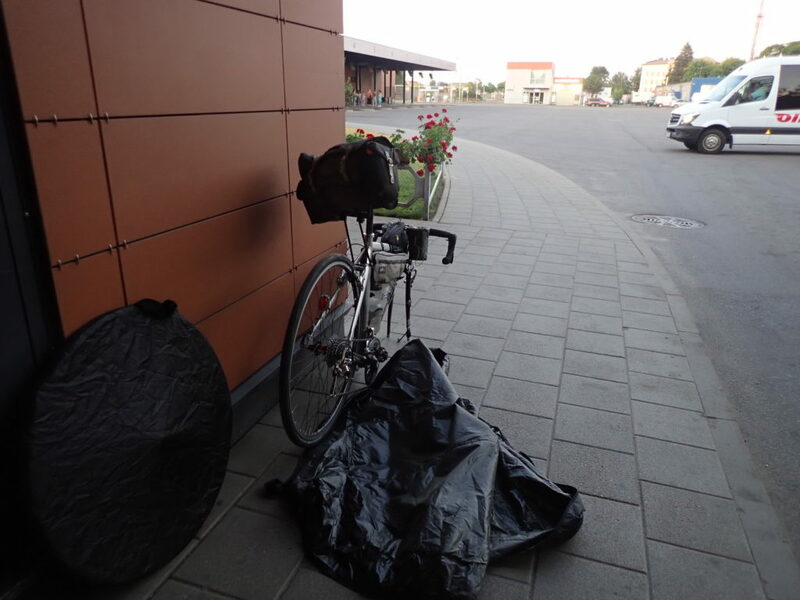 Plastic film isn’t the best way to pack your bicycle, but often the only one. Airports could do a lot better serving customers who ride to and from them. The 5 hour flight itself was a teleport. Sit down, close your eyes, wake up at landing. Only time I was awake was for dinner. Landing, checking that bike is ok and riding to Blue camel B&B. Blue camel was also the place of pre-ride meeting and registration for Silk road mountain race. 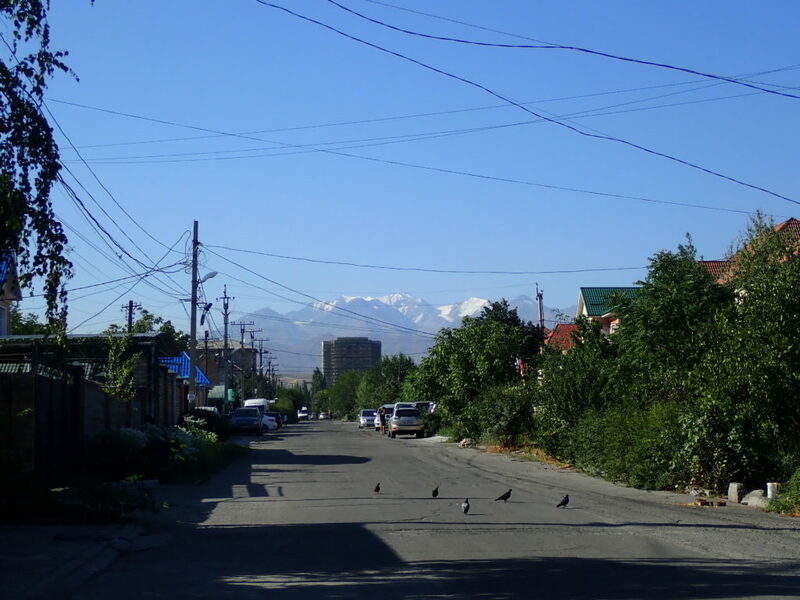 It was about 30 km from the airport and on other side of Bishkek’s downtown. The main road was the only option. Traffic was calm and the road was good for cycling. There were some majestic views to mountains we would be crossing the next day. 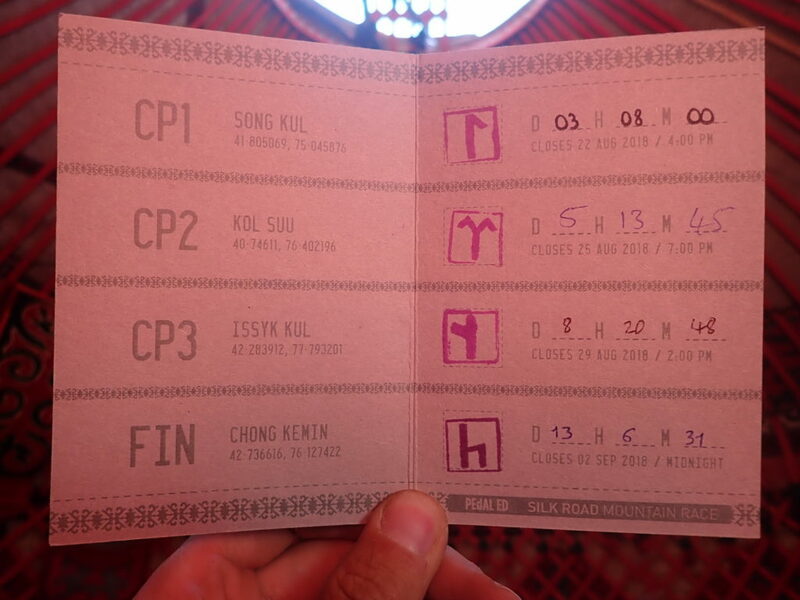 Silk road mountain race is also a story for a different time. 1700 km on remote forgotten places unknown even to most local people. Citing a beer company slogan. Unsupported cycling is serious cycling for not so serious people. I shopped enough food for most of the 3 day train ride from Bishkek. ~15 packs of noodles, some bread, pistachios, cakes, tea and Coca cola. I had lost 5-7 kg of weight in Tcr and SRMR so I had to be careful to eat enough. All train cars have a big samovar so there is unlimited hot water for noodles and tea. In addition to eating everything I had bought, I also ate twice at the train’s restaurant car. That was also a chance to spend most of the remaining som (Kyrgyz currency) I had left. Travelling with bicycle is easy in Russian (and other ex-Soviet) long distance trains. In open sleeping car (3rd class) you simply pack the bike and put it in over head compartment. In the faster Sapsam train from Moscow to St. Petersburg there was a special area for big luggage. The reason I chose a bus from St. Petersburg to back home in Helsinki is that the train to Finland doesn’t allow bicycles. The border crossings to and from Kazakhstan took about 4 hours each. All together the train ride was relaxing. Eating and sleeping for 3 days. Reading a bit, playing some games, eating more and drinking tea. I don’t know much russian so there wasn’t much to talk with others, but at least we tried. Most common language I had was with a old ukrainian couple who had been at Issyk-Kul lake for a holiday and they spoke about as much german as I do. The endless fields of Kazakhstan. 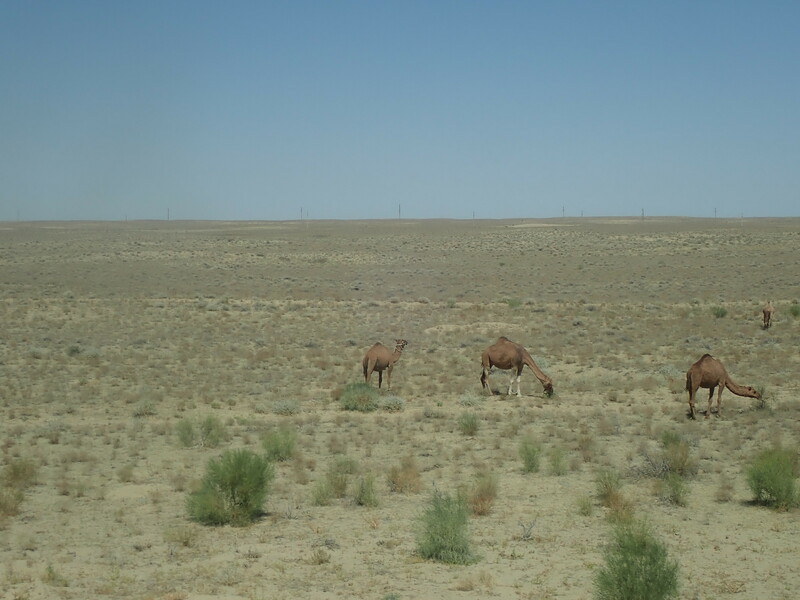 I saw wild camels for the first time. As I arrived in Moscow there was about 1 km walk to the next train station. I went there and left my bicycle to a luggage room. The fellow there charged me 2000 rubles (~23 euros) for the bicycle storage, but I didn’t want to waste time complaining about it. I only had about 5 hours to see the town. He calculated packed bicycle, 2 wheels and 3 bags in the bike (somehow he missed another 2) as 6 different bags and charged for each of them. 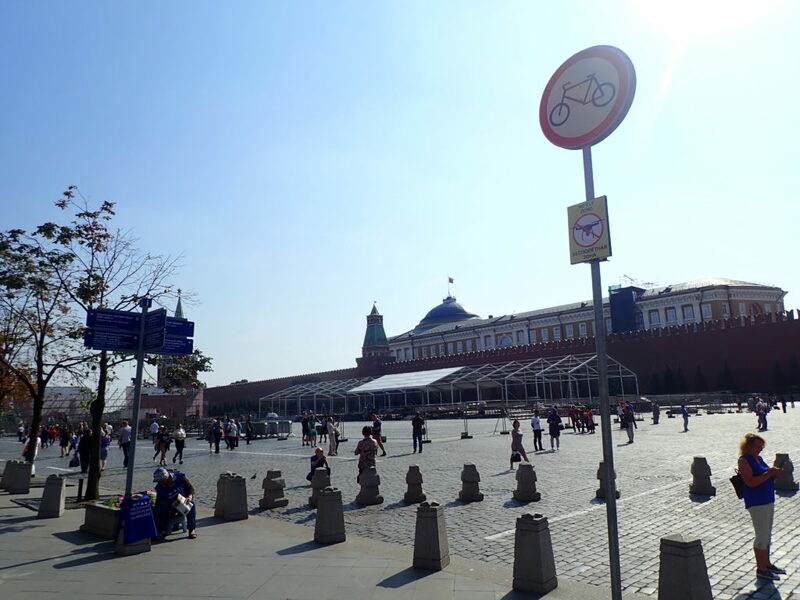 Red square. It is fundamentally important to have a safe place for bicycle while travelling. Finding one can be very complicated. Very few stations have lockers that can fit an entire bicycle. Even going to toilet can be complicated. I often use the spacious disabled toilets, that can fit a bicycle, at busy stations, like when entering or leaving an airport. It doesn’t make any sense, but if you ask staff ”Can I leave my bicycle here and can you look after it?” the answer is usually ”no and no”. I shouldn’t have to ask for it in the first place. At St. Petersburg I had a little less than 2 hours time and about 3 km walk to the bus station. I decided to walk as I had packed my bike a bit lazily and would have to unpack everything again in 30 minutes. At bus station I had the day’s 5th round of security checks, except this time they wanted me to take off all the bags in the bicycle. I complained that my Carradice bag can’t be taken off as it was fixed with zip ties and couldn’t be put back on. With no luck, they accepted that the rule makes no sense, but emptying the bag wasn’t enough, I had the remove it from the bike. This act of security circus took me about 25 minutes and they were kind enough to warn the bus that I might be late. I made it to the bus 4 minutes before departure. I hastily packed the bicycle and put it in the bus and we left in time. When I arrived in Helsinki I used the local metro for the 2nd time this year. With all the bags off the bike and out of zipties I just wanted to get home and to sleep as soon as possible. In short, everything went as planned even though there were many moving parts I was everywhere in time. I hope that booking train, bus or ferry connections will eventually be as easy and reliable as booking a flight. Buying tickets and comparing options is already radically easier than it was 10-20 years ago. This wasn’t an adventure. Really. If you are travelling from place A to B and it turns into an adventure you are doing something drastically wrong. Think what went wrong, ask a friend, read a blog like this and try again. This writing is just about travelling in a way most are not so familiar with. You don’t need to fly over the world around you, you can also travel through it. It will take longer, but the time isn’t wasted. I spend most of my days staring at a screen anyway. I doesn’t matter if my body is roaming to another country. My last day at home and a day waiting at Thessaloniki bus station or in a bus to Leverkusen weren’t that different. Internet works, currency is the same and basic needs are within reach. 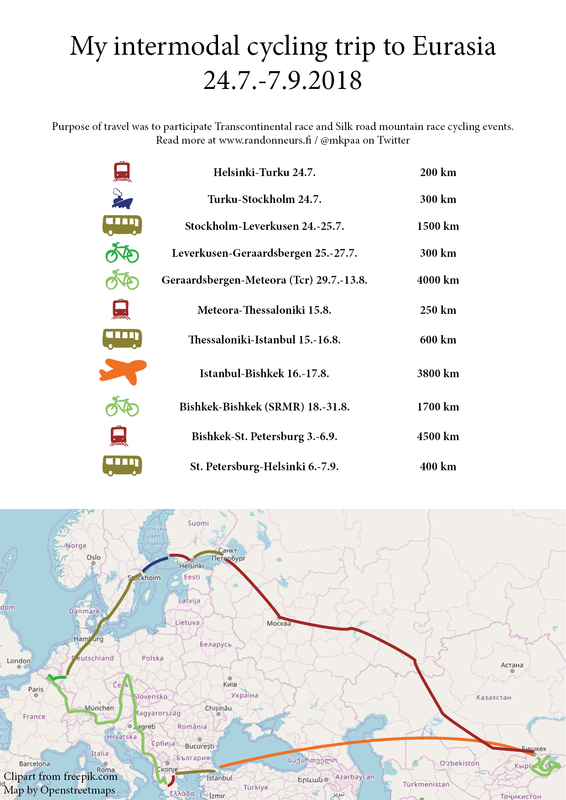 From Finland you can reach any point in Europe within 72 hours combining public transport and cycling. I don’t think I would’ve ever figured that out if hadn’t actively decided to limit my flying. The choice is yours. Just don’t say there arn’t options. Weather conditions may vary, but at least they are never cancelled.